The First Catholic Slovak Ladies Association is proud to announce the selection of Sherlyn Povondra of Tabor, SD as our 2015 Fraternalist of the Year. FCSLA has sent her nomination to the American Fraternal Alliance to be considered for national recognition. The 2015 American Fraternal Alliance Fraternalist of the Year will be announced and honored at the 129th annual meeting to be held in Indianapolis, IN in September. Sherlyn (Sherry) Povondra is an active member of the First Catholic Slovak Ladies Association. She not only attends the monthly meetings, she assists in organizing them, organizing the food/menu, and helps setting up and cleaning up. Education is very important to Sherry. The branch has a scholarship committee, and Sherry is currently serving as Secretary of the committee. Branch W-093 has a float in the annual Tabor Czech Days. Sherry is very involved with the entry of the float, its design and creation. She has a strong knowledge of their community and brings this information to the branch members for ways they can be involved in church and community activities, especially the youth of the branch. She continues to help educate our youth members about their heritage and why volunteering is so important. She teaches by showing them. She doesn't ask anyone to do anything she herself wouldn't do. Sherry is very proud of her Czech ancestry and a dedicated member of the Czech Heritage Preservation Society, Inc. in Tabor, SD. She is currently serving as one of the Board of Directors. For the past 30+ years, she has helped and supported the historic St. John the Baptist Pioneer Rock Catholic Church organization at Lakeport, Yankton County, having continued to stay involved with yearly cleanup and memorial service. Last year was no exception. She is an active member of the St. Wenceslaus Catholic Church in Tabor and serves as a member and officer on its parish council and Altar & Rosary Society and various projects therein. Sherry is a life-member in the Kortan-Hatwan American Legion Post Auxiliary. 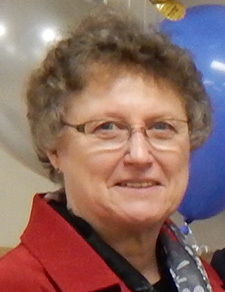 She has served in various offices during her 40 years of involvement. The past year she participated in their pancake breakfast, soup kitchen and other various organizational commitments. Outside of the community, she is also involved with the Avera Sacred Heart Hospital Advisory Board in Yankton, SD. Her ancestry, faith and community are very important to Sherry. She is very dedicated, and has been involved with the same groups for many, many years and is active with all of them on an annual basis. Every project/event that Sherry is involved with can be considered a mentoring program. She teaches by doing. Everything she goes impacts someone. Sherry is a member of the FCSLA Branch W-093, has lived most of her life in Tabor, SD, with her husband, Dennis Povondra, and her son, Mark, who also resides in Tabor. She is currently serving her 25th year as a bank employee for the CorTrust Bank in Tabor. During her son's educational years, Sherry helped establish the local PTA, becoming an officer and active member. Sherry and the PTA saw a need to help the school raise funds for field trips, school equipment to help further the education of their children. Sherry and other members of the PTA raised money by working with the music department to host a spaghetti dinner fundraiser and lunch stands, to name a few. She knew the education of their children was very important and wanted to help in any way she could. She continued inspiring others in the community by serving as secretary for a newly established Bon Homme School Foundation. The foundation continues to lead the way in the community for the continued education of their children. Sherry also thought that all work and no play was not good, either, so she became active with the after prom party to encourage the future of our country to work together, make a difference, but also have some fun. Sherry did not stop just because her son graduated. She has been involved in organizing and planning the first all school reunion in 1985 for Tabor High School and has been involved in the planning process every five years since, including the one being planned in 2015. These reunions will have an impact for many, many years. As a member of the Tabor Area Chambers of Commerce, Inc., Sherry is currently serving as Information Chairperson of the Tabor Czech committee and is responsible for scheduling many willing volunteers to sell souvenirs during the two full days of celebration. Having served in various leadership offices in the organization, she and the organization are busy with projects throughout the year, but especially well known for its commitment to the Annual Czech Days Celebration held each June. She is proud to be Czech and an American. The American flags flown on Tabor's main street on holidays are put up and taken down by volunteers from the Chamber and she inspires her family to volunteer to do so each Labor Day. Her love and enthusiasm is contagious and family, friends and the citizens of Tabor are happy to get involved. In 1989, the State of South Dakota was celebrating its centennial and Sherry was instrumental in establishing a public library for a "lasting legacy project". Having a library science background, she and several others formed a committee to procure funding for a vacant building to be remodeled into a library. Several thousand books and other media were catalogued over the years since being established. Since this time, she continues to act as Chairperson for the Library Board and volunteers as a librarian for this volunteer public library every Wednesday evening. This is truly a Legacy that will live on for future generations. Sherry enjoys the involvement with others and the opportunities given. She continually strives to not only "keep things going as they are" but to make things "a little better" for the future. FCSLA congratulates Sheryln Povondra for receiving this well-deserved recognition. We are very proud to have Sherry represent us as our 2015 Fraternalist of the Year.